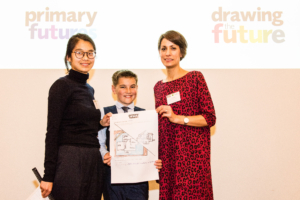 Winners of our Drawing the Future competition received their prizes at an awards ceremony at the British Academy last night and were thrilled to meet career models representing the jobs they drew. 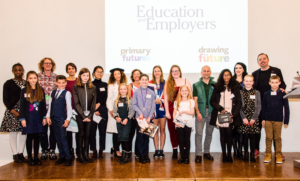 The nine winners were selected by judges – Neal Layton, author and illustrator; Ann Mroz, editor and digital publishing director of TES and Darren Henley OBE, chief executive of Arts Council England. 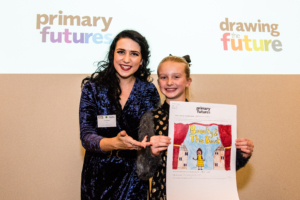 Over 13,000 UK primary school children entered the competition with a drawing of the job they want to do when they grow up. 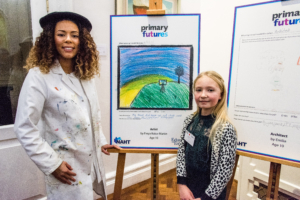 Entries and some additional information from the children were analysed and the findings published in our Drawing the Future report released earlier this year. Awards were presented by judges, Neal, and Ann in front of guests from the world of business, education, and government. The winners were thrilled to be joined by their career heroes on the stage and given the opportunity to chat and ask questions about their jobs. 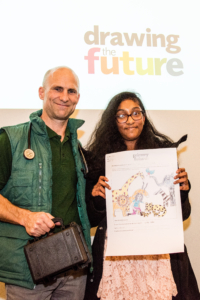 “This event is the perfect opportunity to congratulate the competition winners but also a chance to reflect on the findings of the Drawing the Future report and to redouble the commitment to raising the aspirations of children from all backgrounds. We are asking primary schools to sign up to Primary Futures and start using volunteers to help broaden children’s horizons and see the links between what they learn at school and their futures, and we also ask working people to sign up to Inspiring the Future and give a small amount of their time to chat to children in schools about their jobs – and they could be the inspiration that changes a child’s future”. 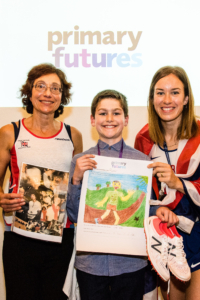 Alex who drew a runner met Stephanie Twell, bronze medallist for 5000m at the 2016 European Championships and competed at the 2016 Olympic Games and Danielle Sanderson. 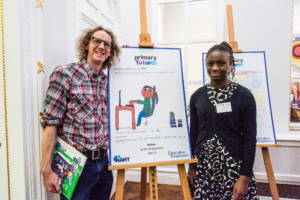 Teni, who drew an author met Neal Layton, award-winning children’s author and illustrator of over 60 books including The Invincible Tony Spears, who is also one of the competition judges. 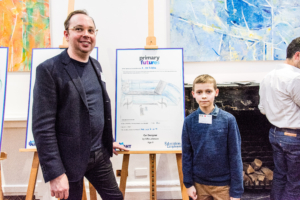 Alfie who drew a car designer met Miles Nurnberger, director of design at Aston Martin. 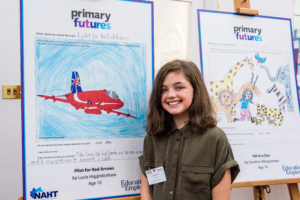 Lucia who drew a pilot for the Red Arrows was, unfortunately, unable to be joined by her career hero as they were training in Morocco but was sent a film inviting her to visit a base soon. 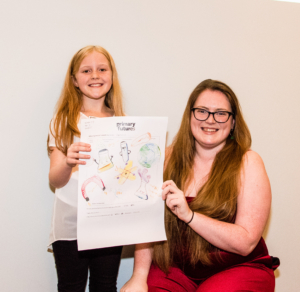 The event was a great opportunity to celebrate the talent and creativity of our young winners and runners up but there was a serious point to the competition’s corresponding survey and report. gender stereotyping begins when children are still at primary school. With ‘sportsman’ (8 per cent), ‘social media’ and ‘gaming’ (9.4 per cent) featuring top of list of chosen careers for boys, and ‘teacher’ within the top choices for girls (18.6 per cent). Children from as young as seven years old, base their career aspirations on people they know (35%). For those who didn’t, 45 per cent stated that TV, film and radio were the biggest factors influencing their choice. Less than 1 per cent of children knew about a job from someone visiting their school. This has real implications for social mobility, as children from poorer backgrounds may not have successful role models from the world of work and their aspirations are limited as a result. In addition, it found that career aspirations of children share little in the common with the projected workforce needs – bringing into light the need for more joined-up thinking between the education system and the future needs of the labour market.